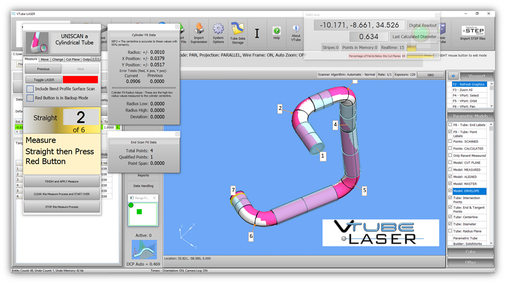 The VTUBE-iMC system combines the world-class VTube-LASER software with ROMER Absolute Arms from HEXAGON Metrology to measure tubes using technology that others cannot easily duplicate. Here is why: The other major tube measuring systems only measure the edge of a tube. However, VTube-LASER uses surface scan data (not edge data) to allow it to do some things not possible with other systems. For example, it can calculate cylindricity, out of round %, and even the real diameter - all on the fly. And it can use this information to determine the quality of the measurement itself and reduce measurement uncertainty in real time. Navigate to our other web sites. See the main Advanced Tubular web site page.